It’s been quite nice to take the last couple days to NOT blog. It is a big commitment to do it nightly, and when I do something, I believe in doing it right or not at all, so you all know I put a lot of effort into the thoroughness of documenting the little things that make these trips so special. I hadn’t planned on much happening in the couple days I had in Te Anau to relax before flying to Tasmania, but of course things did happen that are worth sharing, and that I want to remember for myself as well. Given the pace I hiked, I met many hikers that are just now coming through town in their final days. 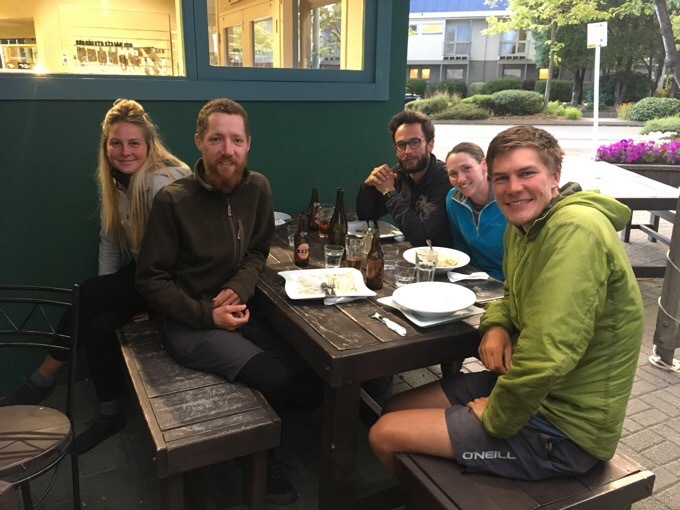 Both in Te Anau and in Invercargill, it was great to see hikers I’d overlapped with as they prepare to finish. It’s a special time for everyone and a sentimental time to see everyone again. The day Becky and Tom left, their friends (Becky and Flo) that they hiked half the South Island with came into town and zeroed the next day. We all had heard about one another and felt like we knew each other though we’d never met. It was great to spend time with them and a couple other hikers I’d crossed paths with as well. We had dinner (ate at the Olive Tree Cafe for the zillionth time, great! ), went to the Te Anau bird sanctuary the next morning, and of course rode the zipline at the park next to the hostel. That zipline really is a must do! Even Jerry, who I mentioned in my last post did it, and it was his 71st birthday. You can’t ride on that thing and not feel utter joy! It really was great to get time with Becky, Flo, Adam, and Max. Yet another thing to bring nice closure to this trail in my final days here. After my day in Te Anau, Griggs returned from Queenstown the next day and we headed back the 2hrs to Invercargill where we would eventually fly out. Griggs was in Queenstown to take a one day course on paragliding. He got pretty much one-on-one instruction and really took to it as we knew he would. He is really stoked to follow through on getting certified to fly solo and add this to his list of activities along with hiking and skiing. It really is perfect for Griggs and it’s exciting that he found something that blends his love for hiking and also flying. Despite my repeated reminders for him to document this big event, he did not get a single photo of the paragliding! I know, I’m working on him and documentation of such awesome stuff. 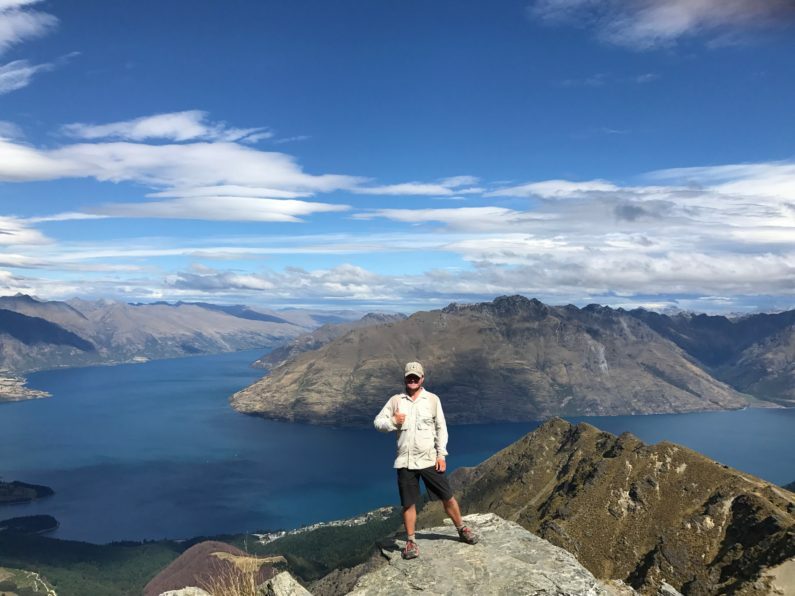 He did get a chance to hike up Ben Lomond Summit while he was in Queenstown and got a photo of that, so that’s good. Baby steps. I will say that I’ve convinced Griggs of the value of documenting and journaling in some form, so he’s now actively participating in Instagram! He will be hiking the CDT in some pretty epic snow starting May 5th, and will be using our Tassie trip to practice daily journaling through Instagram. Follow his feed at @griggsdomler. Pretty excited that he’s going to give it a try. Griggs on Ben Lomond summit in Queenstown. When we got to Invercargill, many hikers were there that would be finishing the TA the next day. 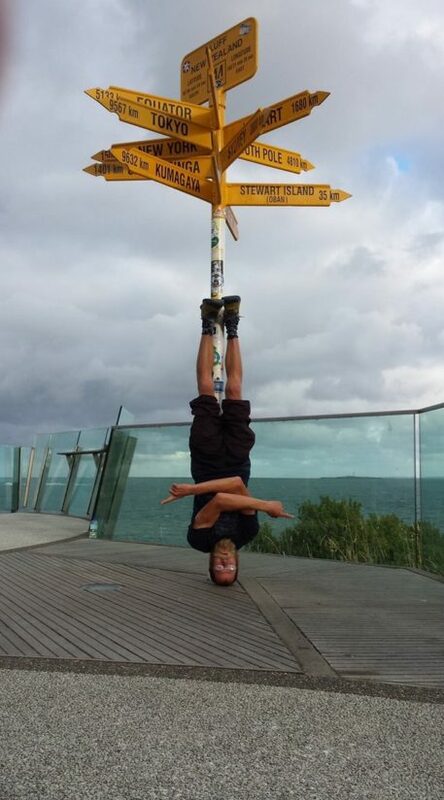 One of them was Matt/Softwalker who I’ve mentioned a few times before and last overlapped with when he and his sister Laurel (who returned home to the states a few weeks ago) were part of the group I went with on the Whanganui River section. It was so great to see Matt! If you recall, he and I were both on the same shuttle to the start of the PCT in 2011, which was the first thru-hike for both of us. He also was born and raised just a couple hours from me in Illinois. We overlapped one day on the CDT in 2013 and now here. Matt absolutely loves thru-hiking and has a contagious energy for it, so it was a great boost to see him one last time before his big day and have dinner together. Matt/Softwalker and I with our “fighting Illini” orange and blue Mountain Hardware Ghost Whisperer jackets. Do I recommend thru-hiking the Te Araroa? The simple answer is yes, I do recommend thru-hiking the Te Araroa. I would not put it possibly in the top 10 of thru-hikes people could choose from, but given the short list of thru-hikes that span a complete country, and give a 4-5 month experience, it is on the list. Not high on the list, but it’s on there. I won’t go into too much detail now, but the TA is comprised of two completely different halves. The North Island is not a wilderness experience overall for people who crave that. It wore on me after awhile to sleep almost every night in a holiday park next to a camper van or in someone’s yard. Yes, some find ways to camp each night on the North Island, but I challenge them to do that legally. I crave the wilderness aspect of thru-hiking and seek to get away from the traffic, people, and stimuli of society when I thru-hike. The North Island did not provide this solace overall, but was still a very unique experience when I look back on it. It did feel like I was basically day hiking many days from one concrete location to another, but where else would I walk along New Zealand farmland, ocean coasts, through small towns, in big cities, experience the Maori culture, ride ferries, spend a week canoeing a river, and also fit in some actual wilderness hiking as well? It’s definitely one that requires a good perspective that can be lost in the moment. I felt like all of this could be experienced more enjoyably by renting a camper van, but what can’t be experienced in that way is the thru-hiking community. No matter what the hike is like, there is nothing like the bond that’s created when people walk together and overlap on the same arduous journey over multiple months. If it wasn’t for the communal experience I had on the North Island, I do not think I would have valued it as much. Now, as for the South Island, it is much more of a wilderness experience. I have to say it is frustrating in many ways with how often it goes along areas that can flood (and often do), but that’s New Zealand for you. The South Island for sure felt like much more of an actual thru-hike, and I definitely recommend it. Many have messaged me privately to ask if I recommend solely doing the South Island. For most, I say yes. Not everyone has the time and money to spend on both islands, and I think your money can be much better spent somewhere else (like Tasmania or Australia) than the North Island if you are limited on funding. It’s a matter of prioritizing what you consider valuable. For me, I am apparently rich (haha) and have accepted this as something that I think is worthy of time and money at this point in my life. Now, know I’ve hiked well over 10,000mi of long trails, so I’ve already checked many other things off the list that I’d prioritize over the North Island. For those strapped for money and time, I totally recommend the South Island, but know that it’s not easy, cheap, or comfortable. I’ve talked with many who only hiked the South Island, and they blended right into the thru-hiking community pretty immediately. Really, there are so many skippers, hitchers, and those making their own routes, that it all gets jumbled and everyone is just out here overlapping. Still, if you’re not one in need of that communal feel, I would recommend just coming to the South Island and doing sections of the TA maybe and then all the major hikes down here that I did as side trips. I’d say that is more worth your time and money if a thru-hike community is not high on your priority list. I also want to point out that everyone has their own enjoyment level of wilderness vs non-wilderness on a thru-hike. I have no interest in hiking the Camino, but that’s a major favorite for many who like a more social kind of experience where you land in town every night. With all of these, what makes them great is that everyone is on a journey in some way and we all are overlapping, so there’s a community there and that’s special. Knowing what I know now, if I could go back in time and decide to do this thru-hike or not, would I? Yes, I 100% would do it! I hope I’ve answered some of your questions on this, and I’m sure for some of you, I’ve just caused more confusion, but that’s all I got for ya. Hey, it’s honest. In just over a month, I’ll do one more specifically geared to advice for future TA walkers, but for now, time to move on to Tasmania! The TA is kind of Camino meets Hiking trail. jack of all trades master of none. see different aspects of the country on your feet. There are many many different caminos. Yes, they all end up at the same spot (Santiago) but you can do other sections of it and be in more desolated places (But, yeah, no longer a thru-hike). The lack of wilderness in the last section in Spain is why I think, if I ever do it, will only do other sections. Thanks for your feedback and opinion on the TA, it was a real pleasure to follow you and changed what I thought and expected about it a bit. Cant wait to read about your new adventures and kuddos on getting Griggs on Instagram and getting him to try journaling on the CDT. I need more aswesome people doing cool stuff to follow! Erin, I have read several of Fozzie’ s books. 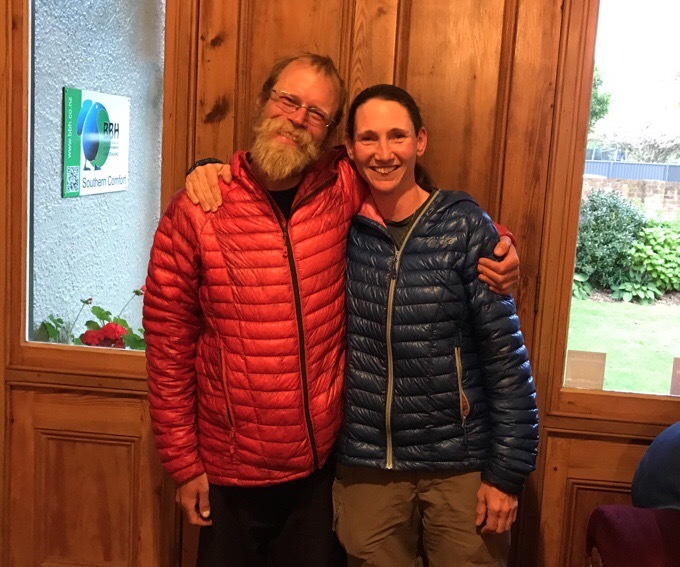 He lives in England, walks there, has thru hiked in the US and done the Camino 3 times.. he mentioned that there are choices along the way and he always chooses the longer, more remote options… I thought that would be your way if you ever were to hike there. But it does seem mire crowded and even reserving ahead, there are places where they expert one to be in for the night awfully early or they might give away your spot. Thank you for writing your journey down for all of us to read. I must admit, it hurt my kiwi pride a bit to hear so many criticisms but I understand that everyone has their own experience and having never walked the TA myself your knowledge is better than mine. I can see it is a very young trail that needs a lot of tender love and care as well as perhaps some rethinking in parts so I hope they take that in mind. I think as NZers we are desperate for other people to share in the joy of our country and when they don’t we can be a little sensitive so sorry about that! 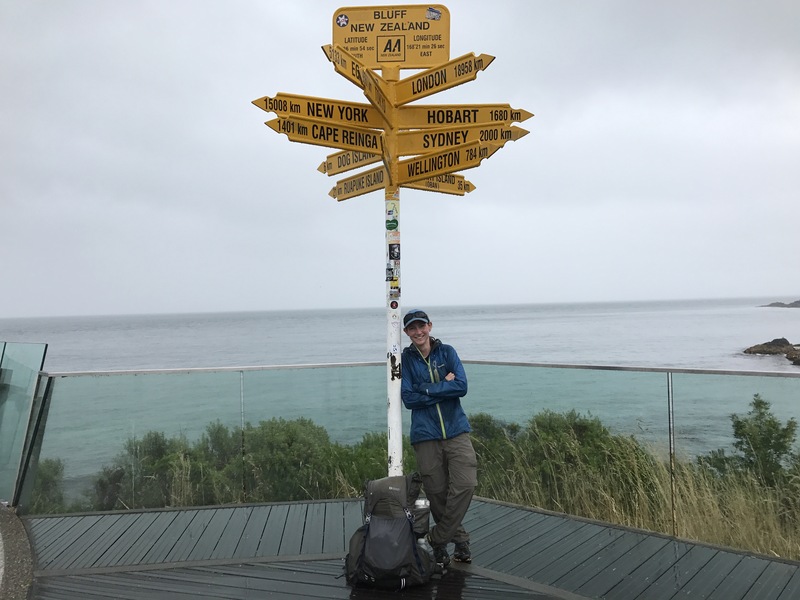 I hope to walk the whole TA at some point in the next couple of years myself as I have been living away from NZ for so long that I feel I’ve lost touch and want to reconnect with my country. I’ll definitely be keeping your blog in mind for when I do the thru-hike. Clare, While the TA may need some work, every friend of mine who has gone to NZ has loved it. All have told me how amazing it is. So regardless of one trail you live in a beautiful country filled with lovely people. Yes, NZ is definitely well worth visiting! It shouldn’t be defined by the TA. Thank you for the write up. I have been following you for awhile now and really like your factual approach to documenting and blogging your experience. How ever, I just resigned from my job to hike the pct this year and to hike the cdt next year. I have been eyeing the TA as a filler hike in-between. But all the negative reports I have read made me unsure about it. If money weren’t an issue I would not care and just go, but unfortunately it is. You sometimes write about costs, but it mostly is pretty vague. Do you feel comfortable sharing how much you spent on this thru? Or maybe just a percentage compared to the trails in the US. Thanks and looking forward to your Tassie adventures. Yup, I tend to budget $1000 US dollars a month to thru hike. That includes health insurance, car insurance back home, my phone bill, etc. I stopped looking after awhile at what I spent here because I just had to accept it. Looking at my bank account it seems that in 4mo, I have spent well over $6000US. Note that I took 10 days of side trips and also took a day in Queenstown that cost a good $400 to do bonus stuff. Those amounts DO NOT include the flights that are around $900US each way to get to NZ from the US. Not exact numbers, but this gives you an idea. I’m curious why you don’t suspend at least most of your car insurance while you’re away. Do you let friends/family borrow it? Yes, I do. I have it on street parking. Thanks so much for your honest opinion of this hike. After following along with you on the north island I realized I would have no interest in hiking city to city along paved roads. Not for me. If I was to ever do this hike I’d stick with the southern island…. and that’s simply my opinion. Please do one of the Camino hikes. My sister wants me to take her on the more popular one…Camino de Santiago. I’ve read it’s 90% paved road. That one doesn’t sound interesting. However there’s apparently a northern route that takes one into and over a mountain range and along the coast before turning southwest and heading into Santiago. Always a big THANK YOU for allowing us desk dwellers to follow along with you. I hope it is ok with Wired to reference another hiking blog. I recommend checking out predictablylost. The blog is by Out of Order, who is currently on the Camino portion of his hike from the farthest northern point of Europe to the far south. It won’t provide you with useful directions, resupply points, the nuts and bolts of a through hike, but it does provide wonderful descriptions of the people and the feel of the trail. He also has some videos from early in the hike, and Theodore Jones is a must watch episode. Who knows, maybe Wired knows him, and won’t mind the cross promotion. I do know him, and yes go for it:) Happy to share! @Mike B… Thanks for the information. I’ll definitely check out the site. I believe I did the most southern portion of that hike three years ago. It’s the Portugal section and it’s called The Rota Vicentina. I went from North to South on it. No camping was allowed. That way the coastal trail was kept natural. I had to sleep in a town at the end of each day. Regardless….I still enjoyed the beauty of the ocean on my right side the entire hike. FYI, there is so much more than the Camino in Europe. The Alps provide a lot of great hiking opportunities, including long-distance trails. Yep, exploring Europe is at the top of the list for me. thanks so much for your honest description of TA even though it might not be to everybody´s liking. It´s now definitely deleted from my bucket list and I´m very happy I could “hike” it with you. Which thru-hikes would you include in the top ten? As for exploring Europe, Nick Crane walked from Finisterre (the westernmost part of Spain) to Istanbul (Clear Waters Rising: A Mountain Walk Across Europe, great book, don´t know if it´s in audio form though), it´s quite inspirational. I have really enjoyed all the ones I’ve done and would recommend them since I can vouch for them personally. There are so many out there and on my list that I’m excited to do! Awesome and clear recap of the hike. I’ve never through hiked but imagine if I did it’d be the PCT because I love those mountains and go backpacking there every year. I think that for at least a lot of us Americans, we desire to really get that back-country experience and just get away from it all. So from that perspective I understand your comments. However, I also understand from the social aspect as well. When you combine the social you have the chance or the blessing to meet others, and maybe the special few, who will bring infinite joy to your life and hopefully you’ll do the same for other. Something that just can never be purchased. So if I ever where to do the TA it’d be for that reason only. Through hikes are so much more than just getting into the backcountry and Erin has brilliantly shown that. I can only imagine how much richer her life is because of embracing all there was to embrace and that it was taken in stride. I think I’ve enjoyed this thru so much more from the social than from the physical/desolation perspective and I’ve learned that thru-hiking has so many aspects. It really is a multi-faceted sport. And I’m thankful to be a part even if only through this blog. Now it’s on to Tassie!! Go!Erin!Go! Excellent recap Wired!! All these comments about where to hike next. You’ve picked up so many skills since the PCT, Why not just create your own hike like Andrew Skurka?? Minus the Brooks Range just because.. I personally prefer the Sierra and there’s just no way to cover all of that terrain. Would be nice to see you do the PCT again but when it really comes down to it, it’s your choice. Thank you for all the adventures you’ve shared over the years.. Hike on Erin!! As a fellow Illini, I will always comment when you post a picture of the orange and blue! Congratulations on your completion of the TA and the thoughts you’ve shared along the way. As a wannabe thru-hiker, I have lived vicariously through your and other’s exploits on the long trails of the world. Thanks for walking and sharing. Since you mentioned the Camino and I’ve walked a portion of the Camino Frances (SJdPP to Leon), I will second the many opinions shared by others – it’s not a wilderness experience by any measure but the social experience is over the top. I have never met so many interesting people in such a short period. It’s a melting pot of nationalities, ages, races, ethnicities, and life stories. I miss it just writing about it. I currently have no schedule to return to the Camino but I know I will someday. Perhaps someday it will interest you, and it will be there whenever you’re ready. In the meantime, Oskee Wow-Wow! I totally thought of you when I posted it too! Griggs, Becky & you should be proud of yourselves to have accomplished the difficult and challenging parts of this trail without skipping or leaving. So glad you found each other (and others) which made this trip even better. Thanks for taking us along with you again, and for being truthful with the reader and keeping it real. Your efforts in blogging are so appreciated, you do a great job. You’re a good writer, you should write a book someday? Anyway, congratulations! Thank you:) No book for me. I like it just how it is here and wouldn’t leave any of it out. I do bound them for myself and that’s been great to have. Great wrap up but you’ve left me wondering. What would be your top 10 thru-hikes (in no particular order)? I’m sure you’ve been asked that before but I’ve only been following your walks since you hit Oz. I can’t vouch for all of them, but I’ve quite enjoyed the ones I have done listed on the blog. My favs have been the Pacific Crest Trail and Great Divide Trail. All have different feels and personalities. I tend to like the mountain ones more than the desert. Thanks for you honest review! I really enjoyed following your TA journey. I’m glad to have read this review as well. To me, the PCT is my #1 desired trail, although because of VISA issues, I can not hike the PCT more than 3 months, so I am planning Te Araroa as my first (and for now, the only) Thru-hike and then experience the bigger wilderness adventure of the PCT for 3 months afterwards perhaps. I am not ‘used’ to the luxury of the wilderness yet as many people who have been hiking in the US have, so I won’t be missing that for sure. I’m glad you pointed out the importance of the social aspect as well, and it takes some of my fears away, I was a bit concerned after some mildly negative reviews, but have also seen a lot of very positive ones. I guess the journey is something I can’t imagine until I go for it myself. This last review has made me a lot more excited again, I can’t wait to see how life is on the trail! Thanks for keeping us up to date on your journey. Enjoy your time in Tasmania! Aw, that’s too bad about the visa limits in the US. There’s always section hiking too, but I know that idea can seem incomplete. It seems you have the right energy and positivity to enjoy any journey regardless and that’s a great perspective to have! Hey Erin, I have loved hearing about your hiking since I met you going out to Mt Aspiring Park. It has given me an insight to what is down the road. I’m looking forward to reading about ore of your adventures. Appreciating your candid observations. Hi Dozy!!! Excited for you and your time in Wanaka. Keep gettin’ out there! I’m really looking forward to your future advice for TAers-post. I’m planning to hike the TA this year and eager to gather as much information as possible. Any plans on when it will be out? Really appreciate the fast response and I’m looking forward to your post.